Chennai, Aug 15 (IANS) Tamil Nadu Chief Minister K. Palaniswami on Tuesday said his government follows the footsteps of the late J. Jayalalithaa to implement various welfare measures initiated by her. In his Independence Day address after unfurling the national flag at Fort St.George, Palaniswami said his government would overcome all the hurdles to serve the people. He said the extent of nation’s development was measured by the development of every individual. Saluting those who sacrificed their lives for India’s freedom, Palaniswami said his government was giving preference to school education and had decided to set up computer labs in government schools. He cited the government’s health insurance scheme to show the government’s commitment to public health. According to him, ration cards were being replaced with smart cards. 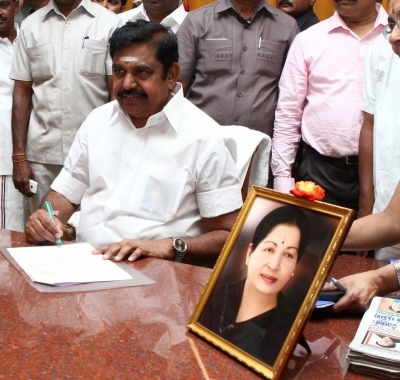 Palaniswami said new industrial estates would be set up in Tamil Nadu’s southern districts. According to him, the state was in the forefront of farm production and implementing various schemes for the welfare of farmers to protect them against natural disasters. The Chief Minister announced an increase in freedom fighters pension by Rs 1,000 to Rs 13,000 and of family pension to freedom fighters by Rs 500 to Rs 6,500. Independence Day was celebrated across Tamil Nadu. District collectors unfurled the tricolour. Many schools also celebrated the event.